Today is the last day of summer vacation and like each year, I’m filled with mixed emotions. In one hand I’m ready for a little more structure and routine but at the same time, I miss the kiddies so , so much when they’re not here. I honestly cannot believe how quickly this summer went by. Maybe because we had a very wet summer and sunny days were far and few in between making it seem short. 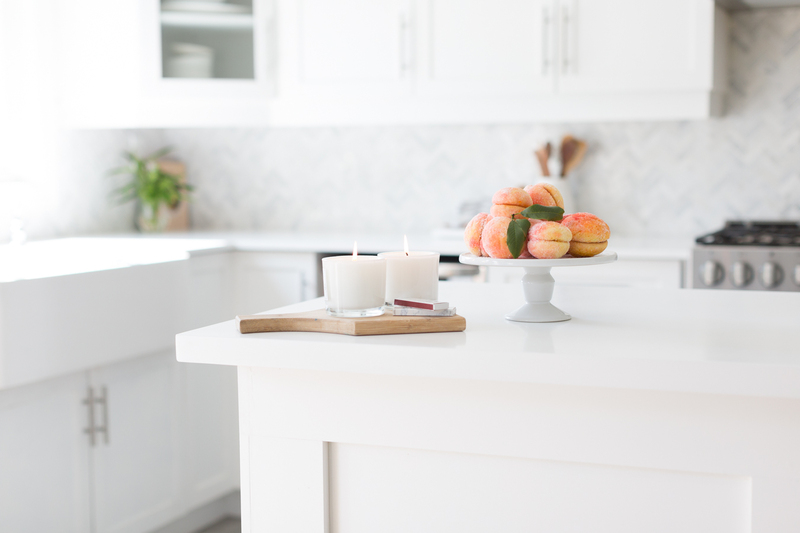 I hope you enjoyed your summer and are ready for some fall inspiration because in the next couple of weeks, some of my friends and I will be sharing a little bit of fall and holiday decor. Today we start in the kitchen. 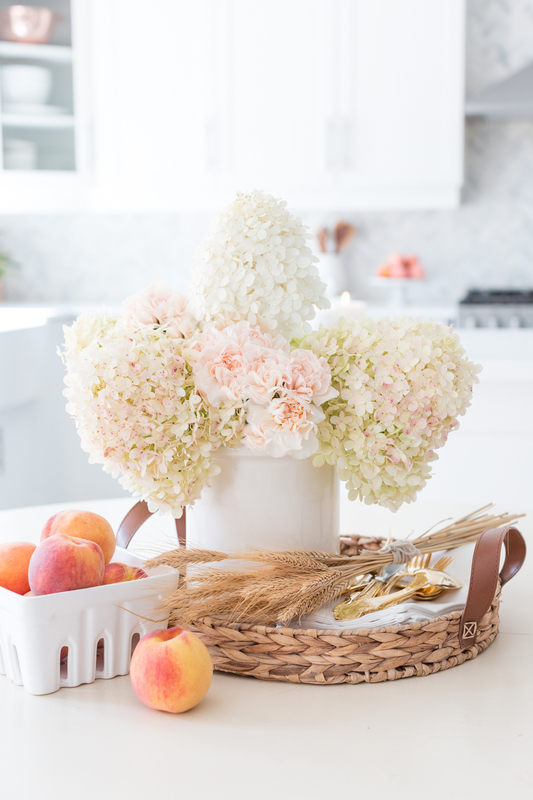 I have to admit that there’s not too much fall happening just yet so I’ll say this is a late summer kitchen post. 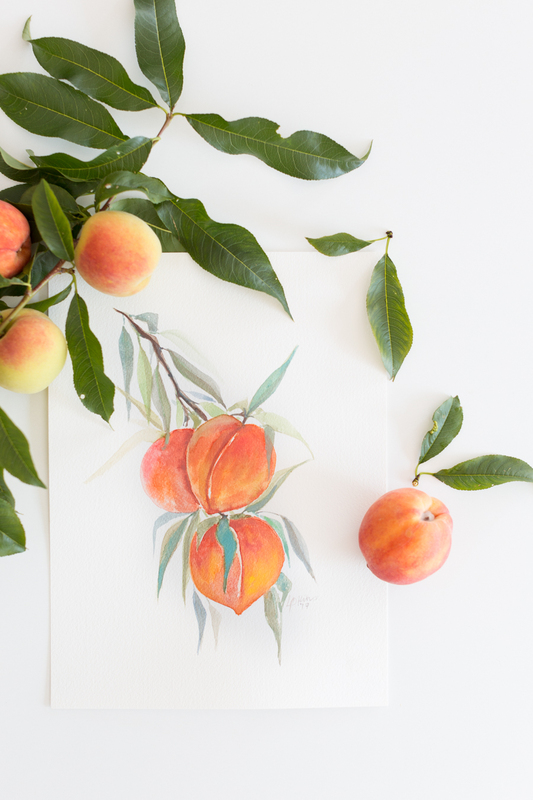 They have the most beautiful peach tree, and I had visions of photographing a branch of peaches on my kitchen counter. They are fairly new to the neighbourhood and so I was a little too shy to ask, but hubby surprised me one afternoon with a little peach tree branch. Just for disclosure, he knocked on their door and asked, he didn’t just take it. lol. And there it is. My little peach branch. 🙂 I then painted this for them as a thank you. 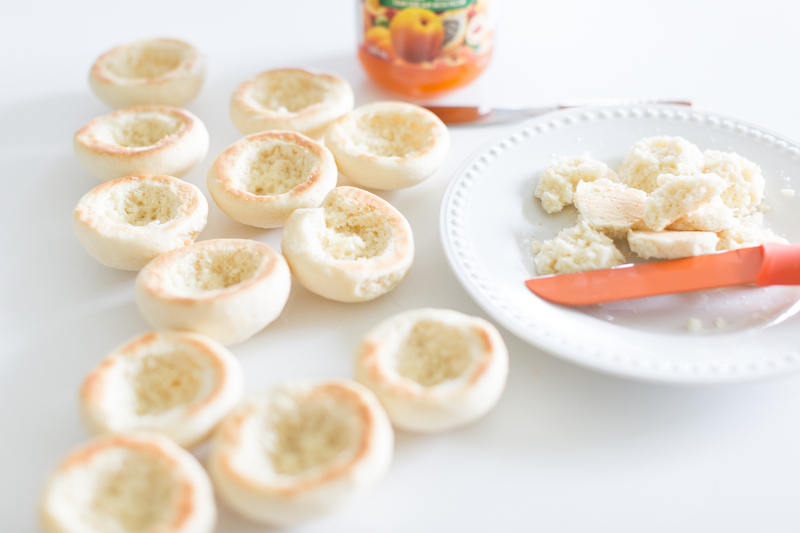 And because I have been so inspired by peaches lately, I decided to make these super cute Italian peach cookies. Don’t you just love them? 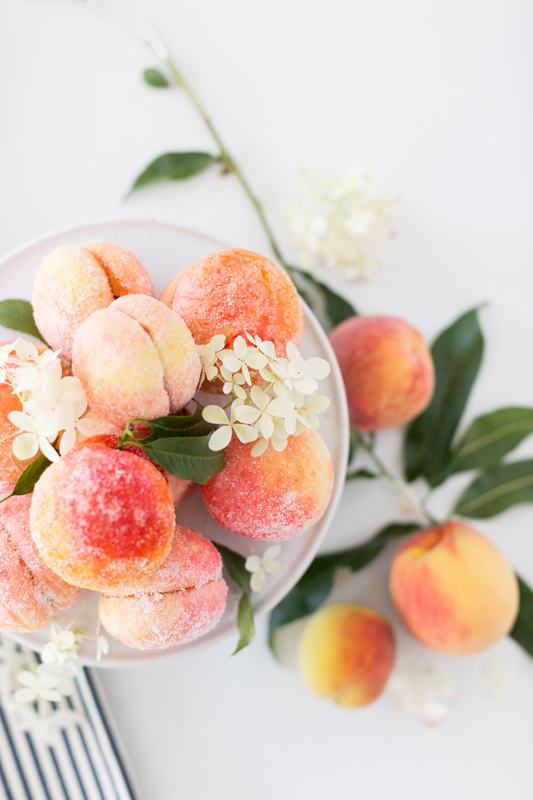 They look just like real peaches and they were also super yummy and easy to make. Key word ‘easy’ because I’m a beginner baker. Peach marmalade or your favourite cream filling. In a large bowl, whisk together flour and baking powder. Whisk eggs in another large bowl. Add sugar and whisk to combine. Whisk in milk, butter until smooth. Gradually add flour mixture, mixing with a fork, until dough is smooth and stiff. Let dough rest for 5 minutes. Roll the dough firmly between your palms to make a smooth round ball, about the size of a walnut. Repeat process, making sure all the balls are fairly uniform in size. Place balls on baking sheets spacing about 1 inch apart. Transfer to oven and bake until bottoms are lightly browned, about 15 minutes; tops will remain pale. Transfer to a rack and let cool slightly. While the cookies are still warm, use a small, sharp knife to cut a circle about the size of a quarter on the bottom (flat) side of each cookie, make sure you don’t crack the edges. Use the tip of the knife to scrape out enough crumbs to make hollow and hold about 1 teaspoon of filling. Set cookies aside. In keeping with the theme, I used peach marmalade, but you can use any type of filling you like. 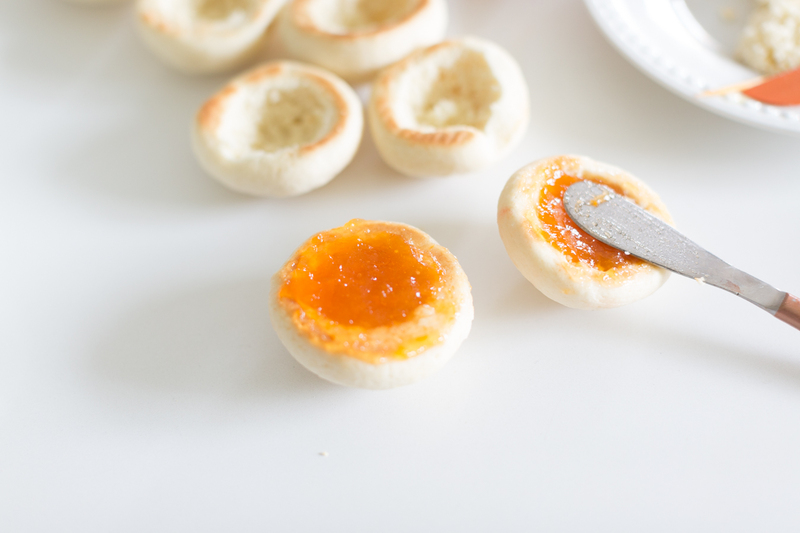 As a matter of fact, the original Pesche cookie recipe, varies from family to family. So I encourage you to find the one you love. 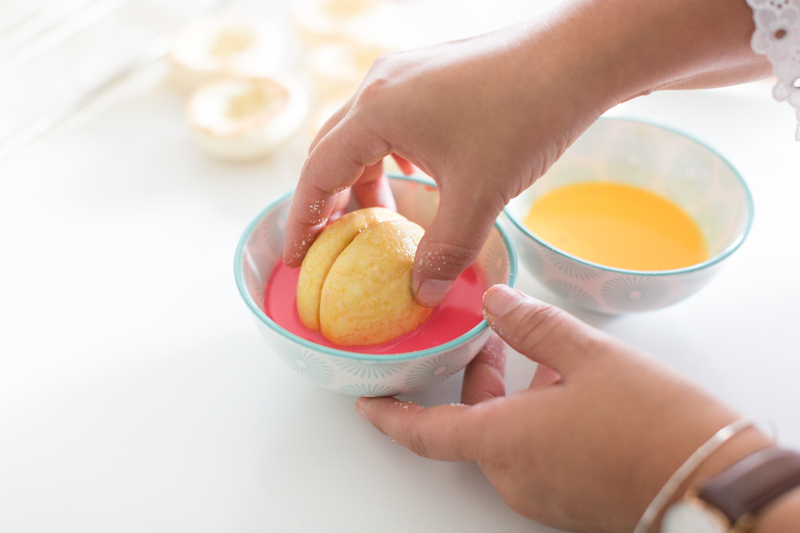 Once the cookies have been filled, place two halves together to form the peach. In two separate bowl pour half a cup of milk in each. 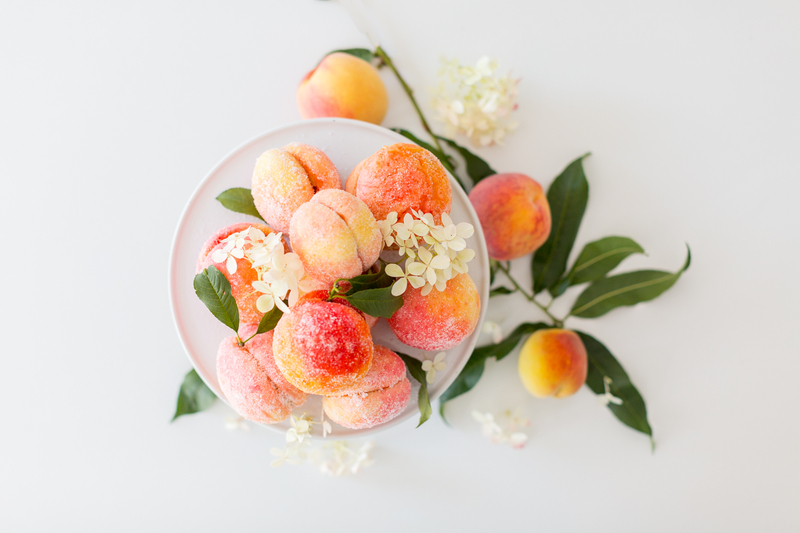 Add enough red and yellow food coloring to create your desired shade of peach; set aside. Fill a shallow bowl with sugar; set aside. 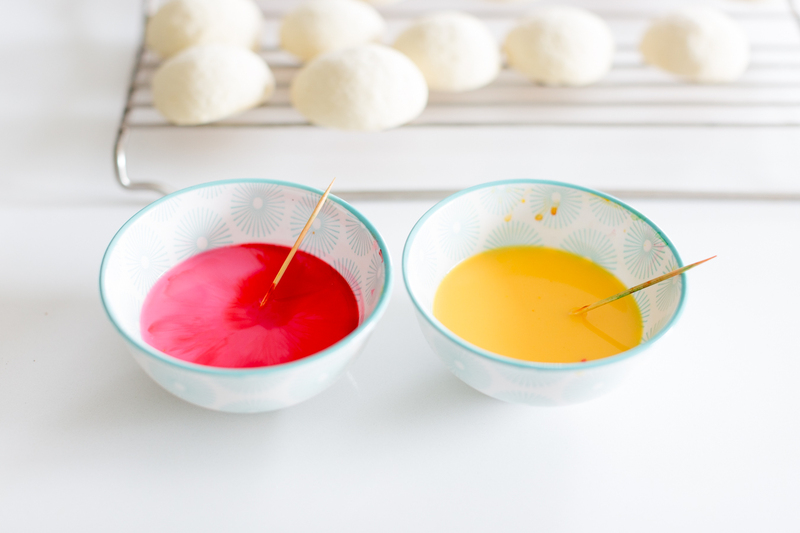 Take the cookie and dip half of the cookie on the yellow mixture. Flip cookie and dip the other half on the red mixture. Let it drip a little and place in sugar bowl and cover completely. And there you go! Aren’t they sweet? By the way, as I was typing this post, my neighbour knocked on the door with a big bowl of peaches! I will also be heading to the farmer’s market in search for some little white pumpkins. Hopefully I can find some as they’re usually not available this early. I’m still enjoying my beautiful Hydrangeas and they’re slowly starting to turn the sweetest pink shade. Well, there you go, like I said, not too much fall happening yet but I hope you enjoyed this little recipe. 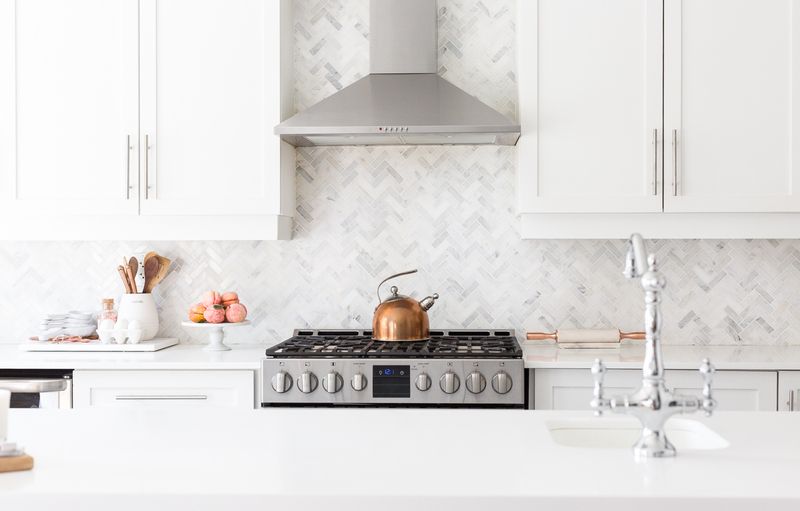 Please don’t forget to visit the rest of my friends and their beautiful kitchens. Lucy, These are the cutest cookies ever!!! 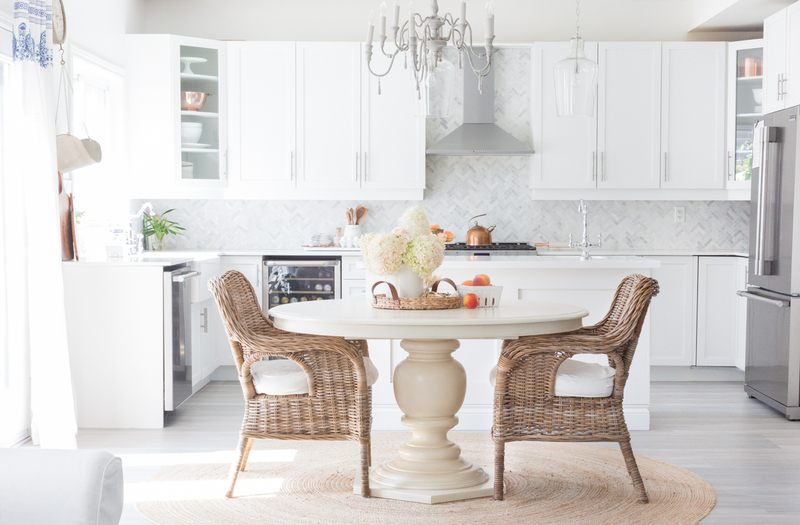 Love your beautiful kitchen! Get out of town!? How gorgeous are these!? And I’m not sure what’s more beautiful the cookies or the painting. In love. They look so yummy! Can’t wait for fall!!! Oh my gosh, Lucy! These are the prettiest little cookies I’ve ever seen! I thought the cookies were real peaches when I first saw them! They are beautiful. I bet your new neighbors are thrilled to have a lovely painting from you. 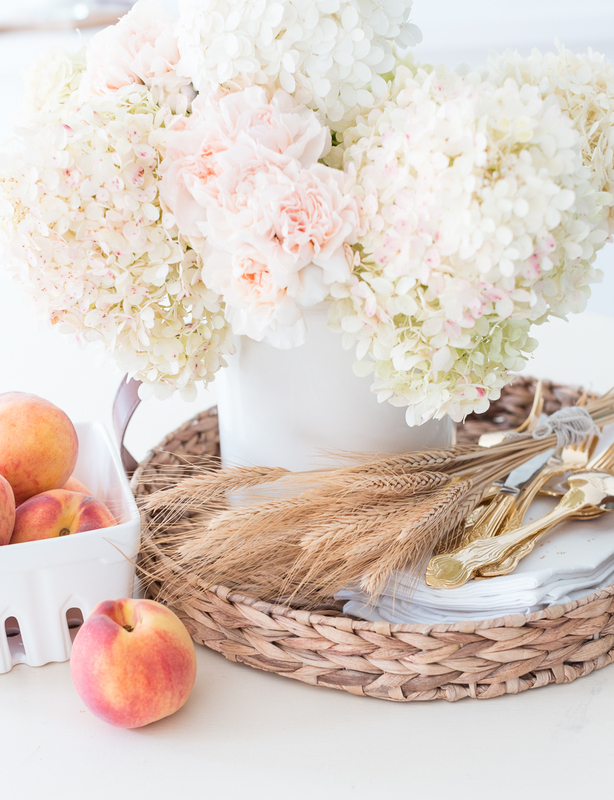 Those peaches are so beautiful!! I can’t believe they are cookies! Your whole kitchen is lovely Lucy. I couldn’t believe these were cookies when I saw them on Facebook. Wow! So beautiful. Sounds as if you have some wonderful new neighbours too. 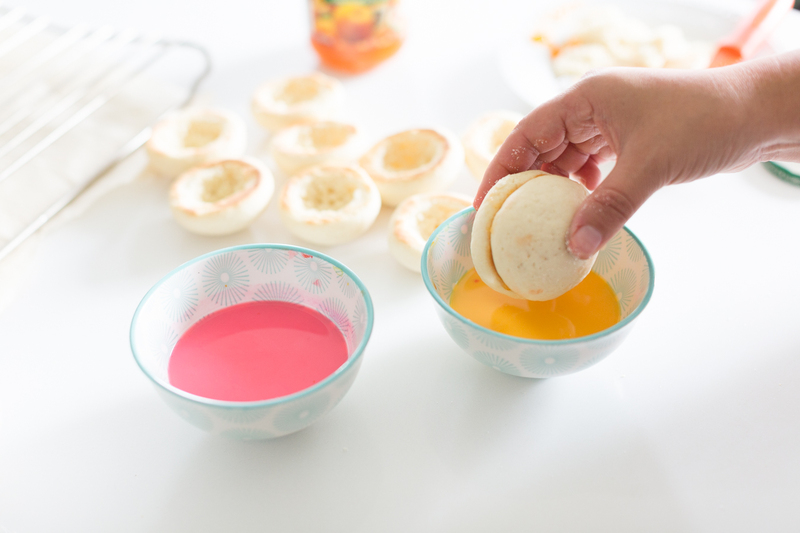 Just a question — instead of scooping out a little of the centers do you think you could make them like thumbprint cookies? P.S. 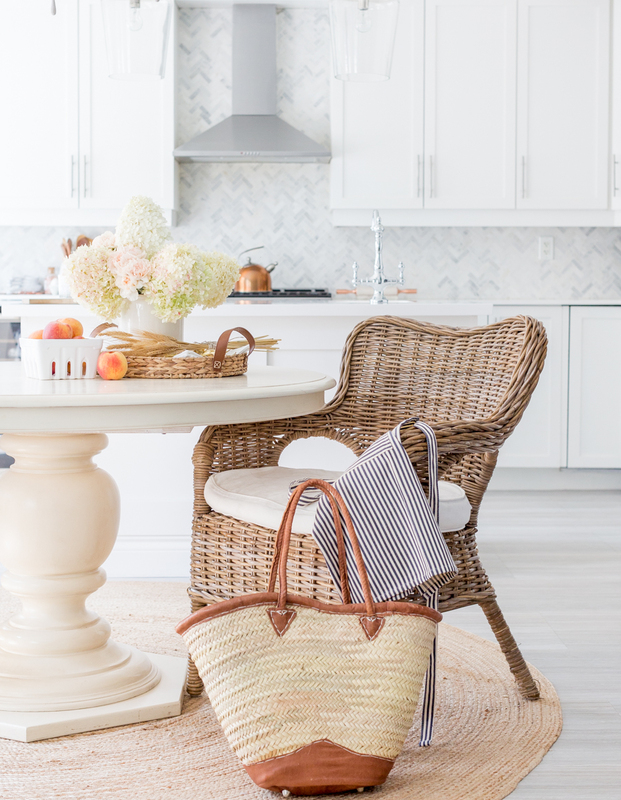 Love your gorgeous kitchen! 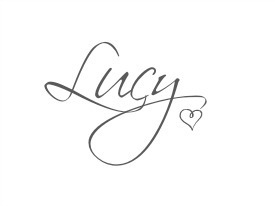 These are so beautiful, Lucy. I can’t believe they aren’t real peaches. Are you even kidding me? I was like what cookies? There are no cookies! You are incredible! Your food posts are always the BEST! 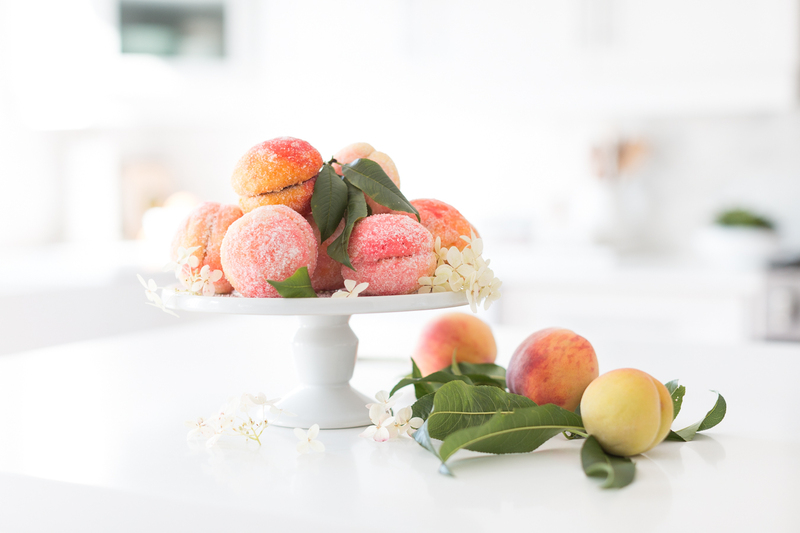 Those peach cookies are just beyond… I can’t believe how much they look like real peaches! Absolutely gorgeous, and of course your home is just perfect. So lovely, as always! My mom and I went to the Farmer’s Market and we bought some of the juiciest peaches my mom has ever eaten and she doesn’t like peaches but she loved those. They looked like your cookies which I thought were real peaches by the way. I love them! I know if I make them they probably won’t look like your photo. The chicks you made were so cute and when I made them they didn’t look anything like yours. I might give the cookies a try anyway though. I also love the photos of your kitchen. I can’t wait to see more photos. What beautiful cookies! Great job! I can’t even handle how pretty these cookies are. You are a master of disguising things to look like the real deal. 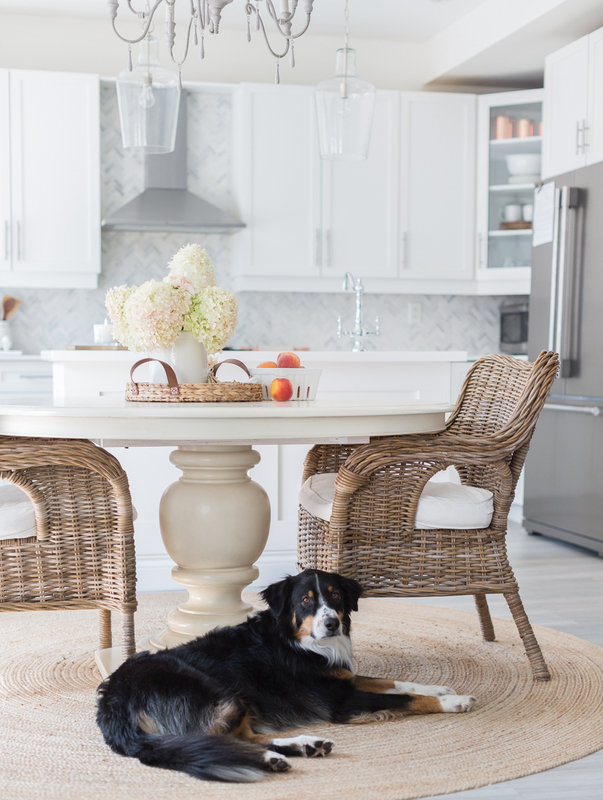 Love your kitchen Lucy! Lucy, these are the sweetest things I have ever seen! I am going to try to make them, in GF version! 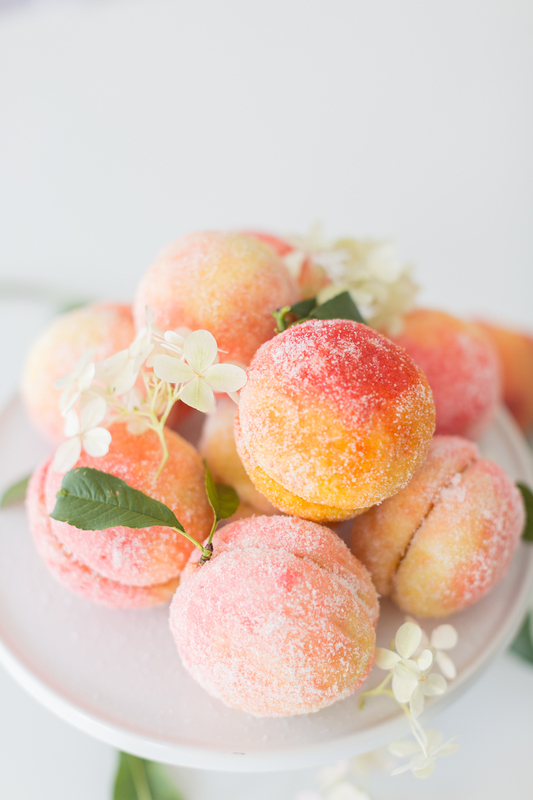 I used to see marzipan peaches that looked just like these for sale in France. They were beautiful! Yours are gorgeous! It was 100º here today. Fall doesn’t show up for another six weeks. I look forward to the change in temperature when it does! 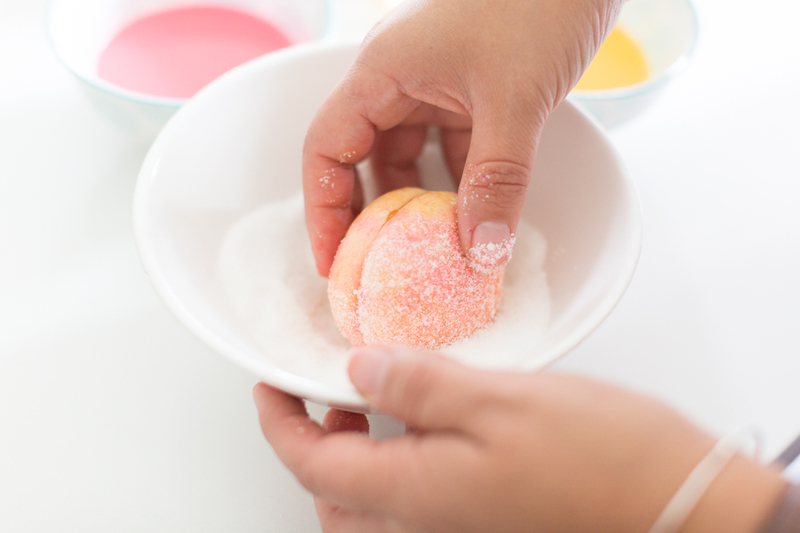 How do you get your cookies to stay smooth on top? Mine “cracked” like the tops of muffins. So the peaches in the end look wrinkled or old! LOL! Any ideas?